Lemon oil, rosemary leaf extract, ascorbyl palmitate, and natural tocopherols. Contains fish and soy. Gelatin, glycerin, purified water, and natural tocopherols. Contains fish and soy. Gelatin, Glycerin, Purified Water, Lemon Oil, Rosemary Extract, Ascorbyl Palmitate, Natural Tocopherols. If you are pregnant, may become pregnant or breastfeeding, have any blood coagulation disorder or are taking any prescription medication such as warfarin (Coumadin), consult your health care professional before using this product. Discontinue use before using this product. Keep out of the reach of children. Gelatin, glycerin, purified water, lemon oil, rosemary extracts, ascorbyl palmitate, and natural tocopherols. Contains fish and soy. Gelatin, purified water, and natural tocopherols. Gelatin, glycerin, purified water, natural tocopherols, sodium alginate, purified stearic acid, ethycelluolse ammonium hydroxide, medium chain triglycerides and oleic acid. If you are pregnant, may become pregnant, or are breastfeeding, have any blood coagulation disorder or are taking any perscription medication such as warfarin (Coumadin), consult your health care professional before using this product. Discontinue use before any surgical procedure. Omega-3 Fish oils with EPA and DHA support the healthy functions of the brain, joints and circulatory system and they support the immune system. * This lemon flavored softgel contains 800 mg of omega-3s per softgel. 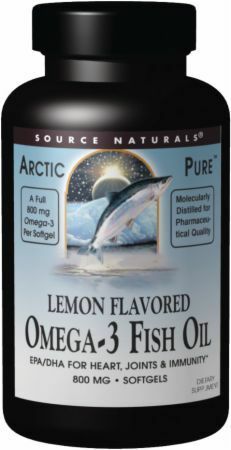 ArcticPure uses omega-3 fish oils from the cleanest sources on Earth. A series of advanced molecular distillation processes extracts and concentrates the beneficial fatty acids from the raw oil, resulting in a product of outstanding purity. The state-of-the art encapsulation process ensures an oil that is pure. The lemon flavor gives ArcticPure Omega-3 Fish Oil a taste pleasing to both adults and children.